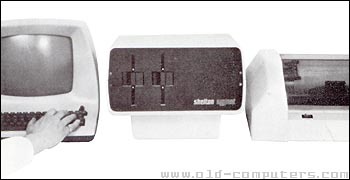 Shelton Instruments were the people behind the original design of the Nascom 1. They were based in London. Sig-Net was a totally new concept, whereby a series of boards - processor, interface, memory, etc. - were interconnected by flexible wires. Each board had its own power supply and many variations of computer could be evolved from the basic system components. The Sig-Net 200 series computer had a number of these modules housed in an enclosure that can have two integral floppy disc drives. The system came with 64 KB of RAM and up to 4 KB of ROM. There were two RS232 interfaces and a 4-channel real-time clock.A hard disk controller could be connected on-board. The system was indefinitely expandable, even to a multi-processor system, using Sig-Net modules. CP/M 2.2 operating system came with the computer allowing the vast CP/M library of software to be used. see more Shelton Instruments Sig-Net Ebay auctions !